In case you haven’t heard…every month we give away 5 cookbooks to active subscribers…3 from the daily email subscriber list, and 2 from the Weekly Meal Plan subscriber list! 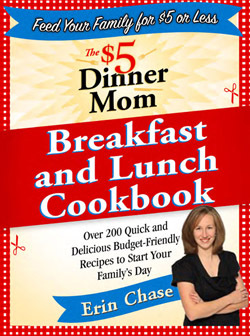 You too can win one of my latest cookbooks by signing up for free email updates from $5 Dinners! Congrats to all the winners! Have fun cooking & saving money,too! Love… Love… Love this Book!!! THANK YOU, ERIN!! !